You'll be £12.99 closer to your next £10.00 credit when you purchase Tracing Your Channel Islands Ancestors. What's this? Tracing Your Channel Islands Ancestors is an expert introduction for the family historian to the wealth of material available to researchers in libraries and archives in Jersey, Guernsey, Alderney and Sark. Full information is given on how to access the civil birth, marriage and death records which are only available in the islands and differ in format from those in England and Wales. Marie-Louise Backhurst covers the census, church records, nonconformist registers, rating lists, newspapers, wills and inheritance, official records, and the variety of other sources that can illuminate a past life and make family history research so rewarding. Migration has played a large part in the history of the islands and details of the records are fully explained. This authoritative and easy-to-use guide to these collections, and the author’s advice on how to use them and get the most out of them, will be invaluable to anyone who is trying to find out about the life and experience of an ancestor who lived in the Channel Islands or was connected with them. This book will equally be essential reading and reference for anyone who wants to explore the history of the Channel Islands. If you have Channel Island ancestors you may want to get hold of a copy of Tracing your Channel Islands Ancestors by Marie-Louise Backhurst. This book provides a solid grounding in Channel Islands genealogy, covering online resources as well as the material available in the various archives. The Channel Islands are often unjustly overlooked in guides to researching family history, and it’s refreshing to see a title dedicated purely to them. 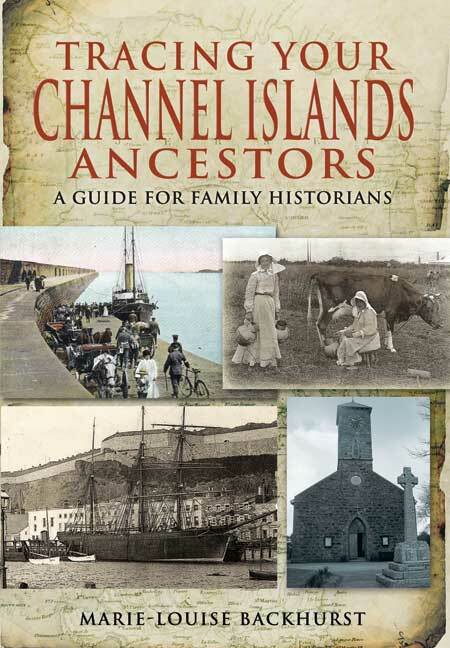 The author is a former president of the Channel Islands Family History Society Family History Society and brings her experience to bear in this useful handbook. After an opening section on Internet resources and sources beyond the islands themselves, there are four main sections exploring jersey, Guernsey (plus Herm and Jethou), Alderney and Sark respectively. A wide variety of sources are covered with information provided on how to access civil and church records to property, occupational and military archives. This book is an authoritative yet simple to use guide. ..an expert guide to the wealth of archive material. This volume contains a wealth of information within its 186 pages. Written in a clear, easy to read format with photographic illustrations and a concise index. The book itself is divided into 5 chapters. I recommend this as a valuable text to anyone researching their Channel Island ancestry. This authoritative and easy to use guide to these collections, and the athors advice on how to use them and get the most out of them, will be invaluable to anyone who is trying to find out about the life and experience of an ancestors who lived in the Chanel Islands or was conntected with them. .. ‘Tracing Your…’ series regularly produces great authoritative guides on a whole range of subjects – but occasionally it comes up with some absolute crackers. I am currently reading Tracing your Channel Island Ancestors by Marie Louise Backhurst, which most definitely falls in to the category. At 184 pages, the book is absolutely packed, and is a truly superb guide. Published as part of the, Tracing Your Ancestor Series. This volume contains a wealth of information within its 186 pages. Written in a clear, easy to read format with photographic illustrations and a concise index. The book itself is divided into 5 chapters. Chapter one Internet resources and sources located outside of the Islands. Chapter two covers Jersey. Chapter three covers Guernsey, Herm and the less well known island of Jethou. Chapter four covers Alderney, and chapter five Sark. There is also a listing of Family History Societies, libraries and archives for the Islands. Each chapter commences with a general discription of the georgraphy, history and the administration of the relevant Island. Followed by, a comprehensive look at the civil records, Church Registers and Surnames and Cemeteries. Also covered are property and other official records, military and migration, education, employment and crime.